Continuing my series of articles about WordPress, today we’re going to learn how to publicise posts by sharing them on the social media platforms that we use. 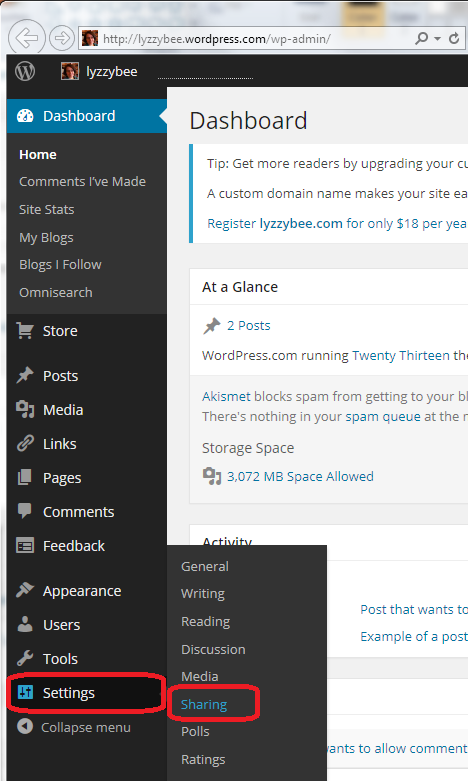 Why should I publicise my WordPress blog posts? 1. It shares your content and lets people other than subscribers and people who are searching on the search engines know that it’s there. 2. It adds content to your Facebook page, Twitter stream, LinkedIn profile, etc., without you making any effort at all. If you’re going to share links to your blog posts on social media, you might as well automate it and save yourself the bother of posting about it all over the place, right? 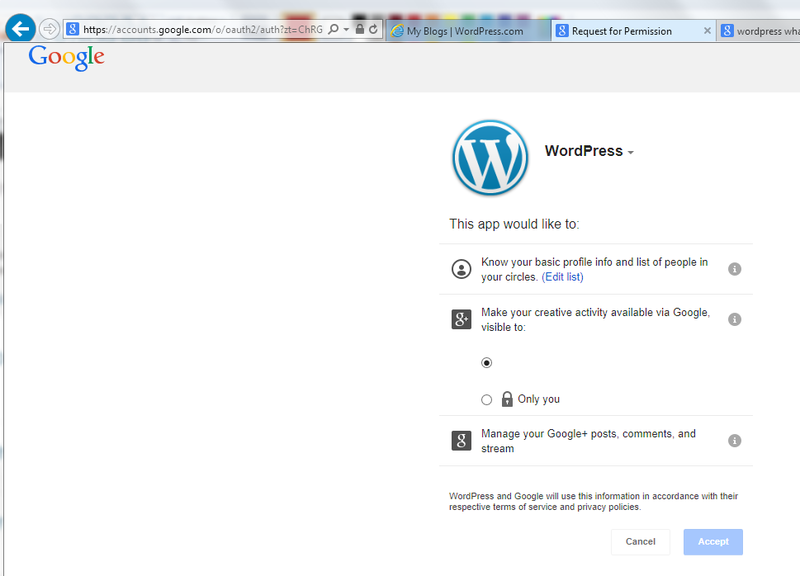 How do I link my WordPress blog to my social media platforms? 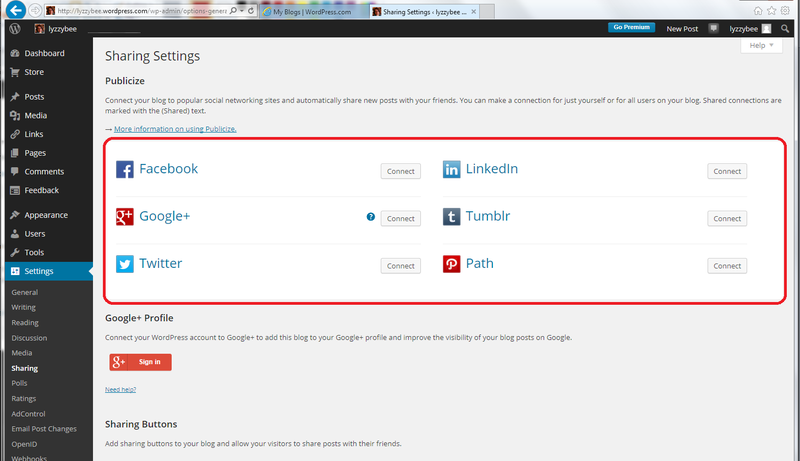 Looking at the Publicize section, we can see buttons for connecting various social media platforms to your WordPress blog. What this will do in effect is auto-post a link to any blog post that you publish it, at the time that you publish it, without any effort on your part. How do I link Facebook to WordPress? There are two things to note here. 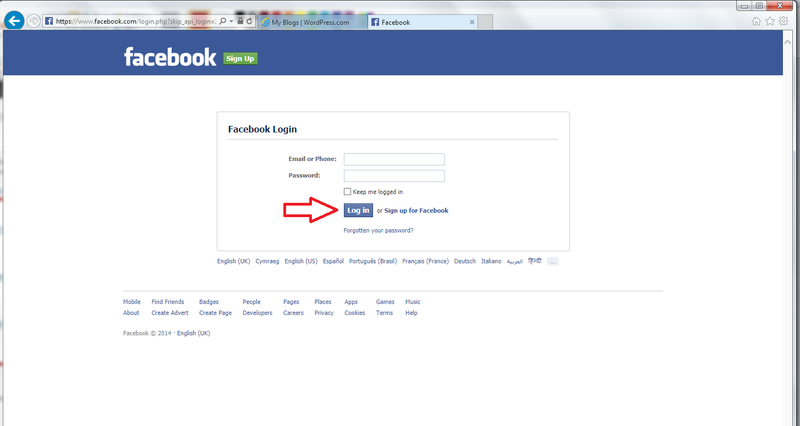 One, you can only link one Facebook account at a time, whereas you can add more than one login to most other social media types. Libro Proofreading … is my business page – for this blog, I have linked posts to that account, and then I pop in and share them onto my personal timeline. The other thing to note is “Make this connection available to all users of this blog?” This is for a situation where you have more than one person with admin rights over the blog: you can choose, for example, your company or organisation’s Facebook page to auto-post to, and make that option available to everyone who posts on your blog. 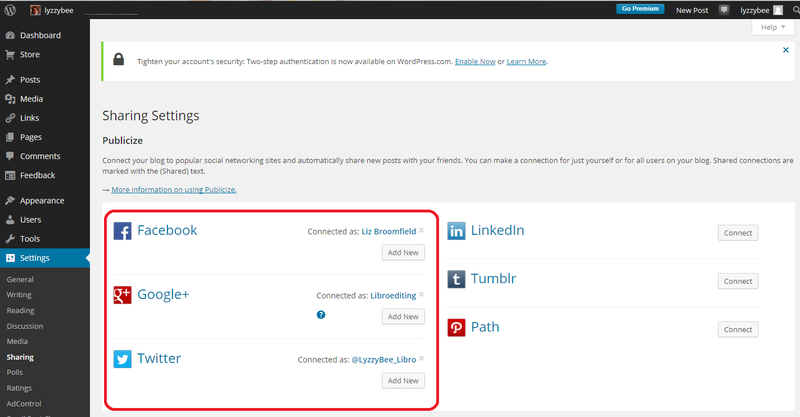 How do I disconnect my WordPress blog from a social media platform? 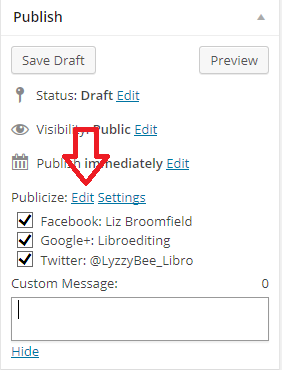 If you wish to disconnect any of your social media platforms across all new blog posts, click on the x next to the “Connected as [your name]” message. It will ask you if you’re sure: if you click on OK, the link will be severed. To reconnect, go through the same process as above. 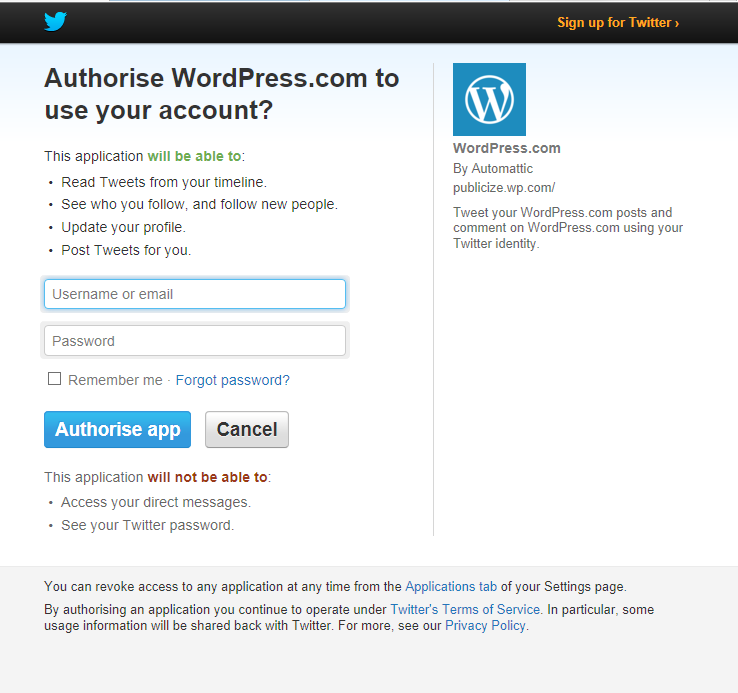 WordPress may remember some of the steps when you do this, such as your username. How do I manage Publicize in my blog posts? 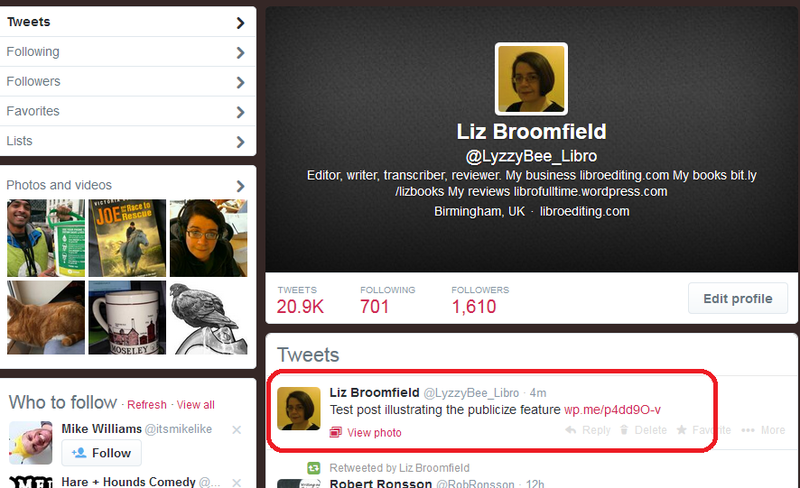 Let’s have a look at what Publicize looks like in your blog posts. Note that sometimes WordPress will become disconnected from one of them for apparently no reason. A message asking you to relink will appear in this area. Click through, provide the details it asks for and the two will be reconnected. Clicking on Settings just takes you back to the original Sharing Settings screen we were looking at above. What gets posted to my social media when I’m connected to WordPress? I’m just going to share two examples here, but you’ll get the idea. 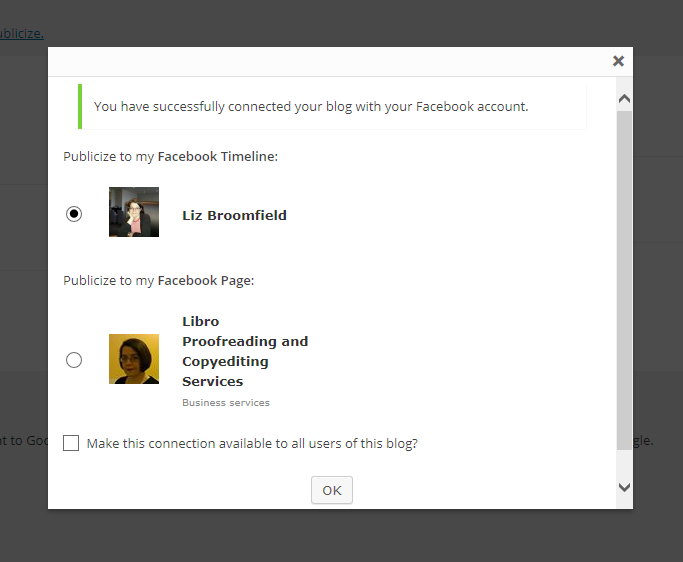 When WordPress is connected to Facebook, an entry will appear in your timeline, with any picture that you included in the post (very large in the current incarnation of Facebook!) and a bit of the text, and there will be a link, arrowed here, which will take the reader to the blog post itself. Today we’ve learnt how to use the Publicize feature of WordPress to link it to your social media platforms such as LinkedIn, Twitter and WordPress. Next time, we’ll be looking at how you can enable your readers to share your blog posts through the use of sharing buttons. Thank you for your comment? Are you using self-hosted WordPress rather than WordPress.com? If so, you may need to locate and download a widget to allow you to set up sharing. I hope that helps. 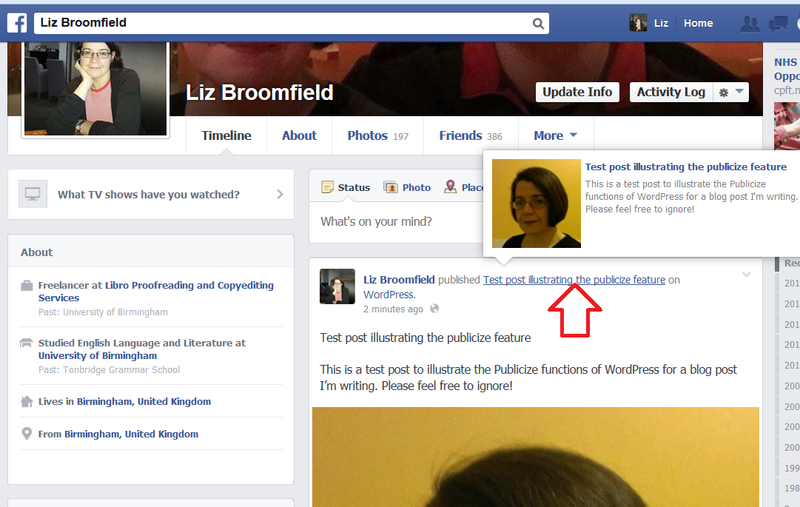 When I use “Publicize,” my blog post appears on my Facebook page, but it does not include the photo. Since my blog is a photo blog, the (missing) photo is a key element in the blog post. What am I doing wrong? Unfortunately, this is likely to be Facebook’s fault rather than yours or WordPress’s – I find that it often pics a random image from within my posts rather than the one I stated the post with, for example. What happens when you post a manual link to your blog post in Facebook, does it work then? Thanks for your comment, I get my information from what I’ve learnt setting up this website and blog. I really don’t want to integrate my blog with Google+ so have not enrolled in the double authentication crap. I just want FB viewers to go smoothly to my blog w/o getting a reconfig notice. Can you help? Just what I was looking for, very informative to help #addwebsitetosocialmedia. If only I knew the answer to this question. I feel silly asking it. When I first publish a blog entry, at the bottom are buttons which I have been using to share it: Facebook, Twitter, and the big W with Press this on it. What happens if I press the big W with Press this on it? 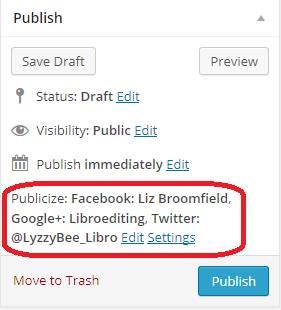 is that necessary for my blog post to be fully published? Does it just publish the blog entry on my blog? I don’t know if I’m missing out on something by not using it. Thanks in advance for your help. Hi there, not a silly question at all, don’t worry (the only silly question is the one you want to know the answer to but don’t ask!). The Press This button at the bottom of your blog post allows other WordPress users to create a quick link that they can add to their own blog, thus sharing your content on their blog (a bit like Reblogging, but in this case you can copy just a bit of a post and hit “Press This” and it will copy itself into your blog. 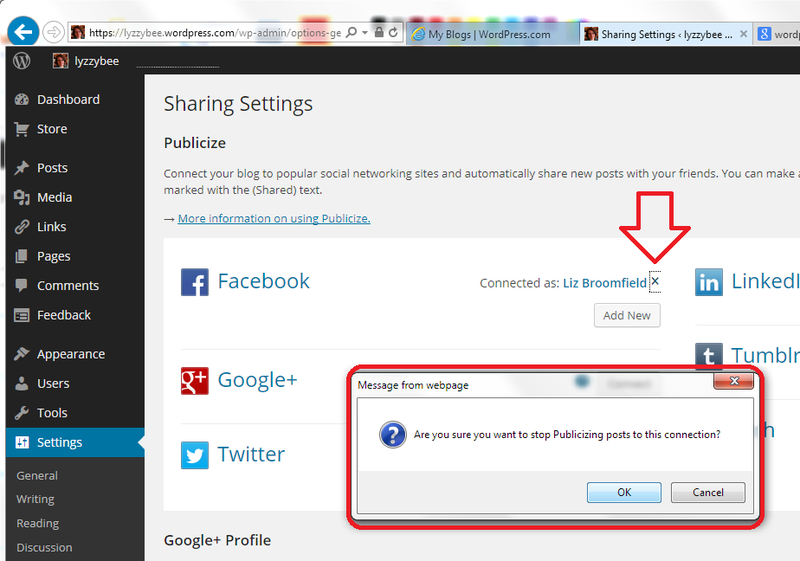 So you don’t need to do anything, but other WordPress users can use it to grab content to share.